Today is post-op day two and Jody is progressing wonderfully. I am amazed at how much has changed in such a short period of time. I ended my last post telling you that Jody was going to have a swallowing study done before he would be granted permission to eat or drink. In the words of the surgeon, he “Failed miserably!” This comes as no surprise. During the transplant itself the vagus nerve is cut and this can impact ones ability to swallow. I’ve read that it’s quite common for people to fail their first swallowing study. Dr. Shah wants to repeat the test on Friday but until then, no food or drink. Jody is dreaming of an Italian sub and many of his favorite foods. On the plus side, they are allowing him ice chips and I don’t think they have ever tasted so good. Immediately after Jody was extubated and able to talk (more like utter a few words here and there, since he wasn’t up for much talking), we noticed his voice was very hoarse and quiet. This could be the result of damage from the breathing tube or from the vagus nerve being cut as previously mentioned. The doctors have been keeping a close eye on this and said they can do injections to help his voice if it doesn’t improve. But guess what… it did! It’s still not perfect, but it’s much better. Yesterday morning Jody had four of his six chest tubes removed. In case you’re wondering, chest tubes are tubes that are inserted through the skin and into the lining of the lungs to allow drainage of fluid and air. It was great to see him lose those four tubes, but the two remaining are causing tremendous pain. I’m going to estimate that the tubes removed were a 1/2″ in diameter and each one was inserted about 8″ inside his body. You can imagine how having 48″ of plastic tubing inside you, moving and rubbing might be painful. Pain management is working with Jody to ensure he is as comfortable as possible. Even though only two tubes remain, he is moving and walking now so when the tubes inside him move, it causes intense pain and his entire body begins to shake. It also hurts to take deep breaths which is important for him to do. Jody looks forward to them being removed once the amount of drainage coming from them decreases. Get well wishes from the girls (taken in the ICU). Jody’s blood pressure, which had been really low, hanging in the 60’s is improved as well. He is still getting IV medications to help with this, but it is staying in the low-normal range. Yesterday he also had the Swan Ganz catheter removed (this is a catheter that is inserted through his neck and into a pulmonary artery to measure pressures in his heart). Anyone with this type of catheter is required to be in the ICU so with it gone and with all of the progress he was making he was ready to be transferred out of the cardiovascular surgical intensive care unit. I couldn’t wait to get him out of there. There are a lot of rules and regulations in the ICU, and I had to leave from 6-8 am & pm (four hours a day) for change of shift. The nurses were great (for the most part), but I often feel they see little need for family involvement (including a spouse). It’s frustrating being asked over and over to leave for minor things, especially when I felt Jody would benefit from me being there. I think me being a nurse (which they didn’t know), and having a need to know what was happening medically with Jody, made this even harder. So many times I had to bite my tongue and walk away graciously. Because I couldn’t say it to them, I’ll say it to you; I know without a shadow of a doubt, their perspective would change if it was their loved one lying in that bed. That issue aside, Jody really did receive wonderful care in the ICU and I’m so grateful. Jody is now in the progressive care unit where he will stay until discharge. I’m loving it here already. I don’t have to leave for four hours a day, there is a toilet and shower in the same room (I was going to the NICU to shower, and had to walk a long distance to use a bathroom). 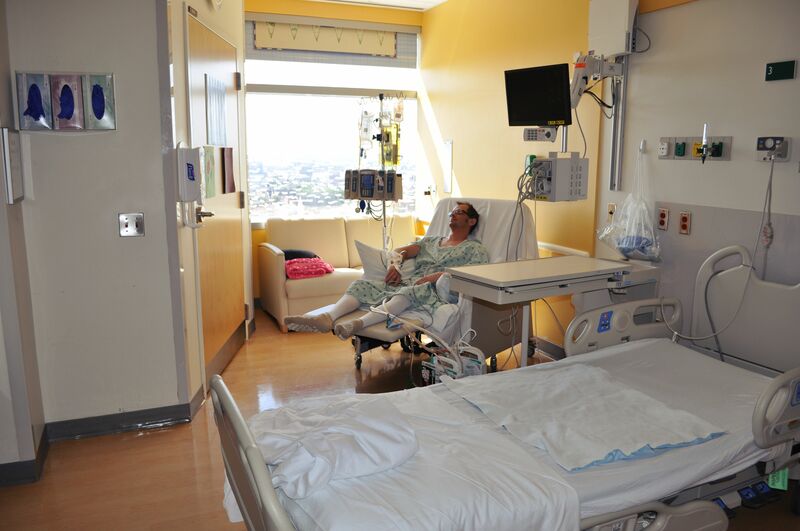 The nurses seem relaxed and the overall environment is less strict. I can even walk into his room at anytime without the secretary stopping me to “check with the nurse if it is okay.” An added bonus… he’s got a room with a fantastic view of the Harbor. One small area of concern (to us, not so much to the doctors) is Jody’s vision. We are not exactly sure when it started, he noticed it yesterday, but he is having a hard time seeing. He can’t even read a text message on his phone held right in front of his face. Dr. Shah thought it was blood pressure related, which has improved but his vision has not. Now he is thinking it is epidural related. It could also be related to one of the new meds he’s on. The plan for now is to wait until the epidural is removed and if it doesn’t improve after that they will consult ophthalmology. Prayers appreciated. There is one more random piece of information I would like to include even though it doesn’t really ‘fit’ in this post. I find it interesting and would like to be able to remember it so I need to include it. This relates to a post I wrote back in March of 2013. Jody was having major hemoptysis (bleeding from his lungs) and had an extensive pulmonary embolization. If you ‘followed’ me back then you might remember that in order to stop the bleeding they injected micro beads into his bronchial arteries which acted as clotting agents. I clearly remember being told that they had to use more clotting agents on Jody than they had ever (in the history of Hopkins) used on a patient. You can read more about that by clicking here. Anyway, fast forward to the present. Dr. Shah told us that when he made the cuts to remove Jody’s old lungs the clotting agents came spilling out. He made it sound as if they were flowing everywhere and all over the place (probably not literally, but how he made it sound). When I told him about how much of the beads they had to use to stop the bleeding, he said he was not at all surprised to hear that based on what he saw. For some reason I found this tidbit oddly fascinating to know. Today is September 17th, 2014. 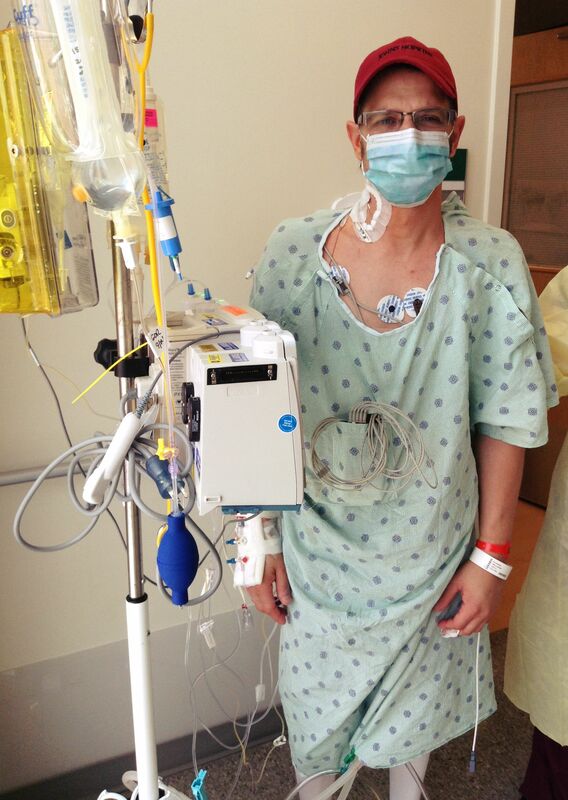 On September 17th, 2013, one year ago to the day, we were told the hard truth… that Jody needed a lung transplant. We weren’t prepared for those words, and it took some time accepting that fact. Today we sit here, new lungs installed, and we rejoice in the miracle of it. This past year has been rough, but the doctors were right, Jody needed lungs. And now he’s got them! Great great news! So wonderful to hear. Prayers for the eyes and other concerns. I know those chest tubes are so painful! Thankful he got some of them out & hope he gets the others out soon. So weird bc his room looks just like our step down room we had in Texas!! Just like it. Lol. I’ve been thinking about and praying for you both a lot this week! Such great news and thankful everything is going well!! I love that you were able to use this as a teachable moment for your girls. I firmly believe that Aliza will NEVER need a lung transplant. Her lungs are being protected in ways Jody’s never were because of the advances in medicine (and partly because of the adult CFer’s, like Jody, who were the experiements). Soon there will be a cure and instead of decreased lung function you’ll only see Aliza’s increase. I’ll rejoice with you on that day! Such a wonderful update to read. We are so happy to hear the continued progress. Walking? Yay! That is such awesome news. We continue to think about and pray for your family. The girls ask everyday how he’s doing. So so happy to read about these steps of amazing progress! Thank you for writing so many details in your blog!! 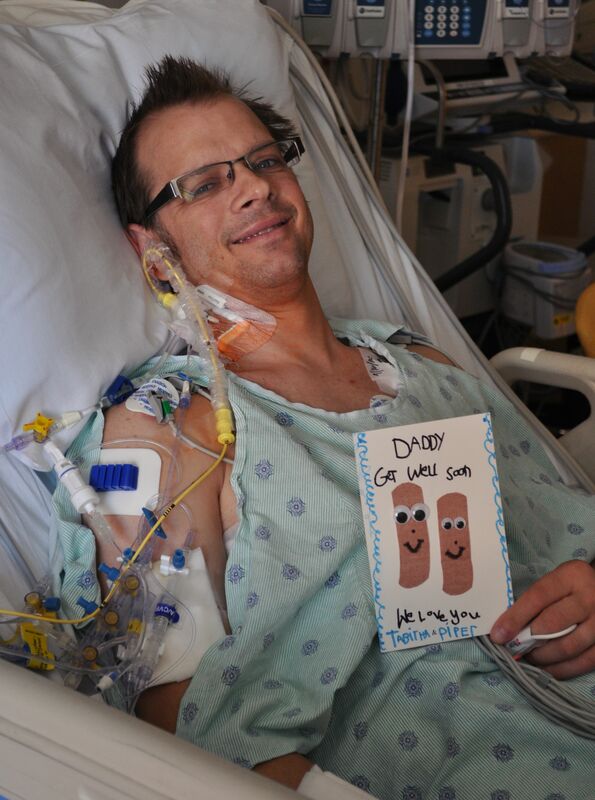 This fellow CF wife with 2 young kids also as we await my hubby’s new lungs really really appreciates the details!! Continued wishes for an amazing recovery. Praying for your family. So excited to here Jody’s progress. God is good. Love you all. It sounds like he is really progressing well. Praise the Lord!! Praying that he continues to move in a positive direction & that they will find & fix his vision problem. Praying they will continue to control his pain & that the last two chest tubes come out soon. Praying for renewed strength daily & that his next swallowing tests will be normal so that he may eat & drink. Praying for good rest for you both & for your beautiful girls & those caring for them. May you both continue to feel God’s closeness, draw from His strength & experience His peace, knowing that He has it all under control. Blessings & love to you!! Jody, my word, you are amazing! You will be home in no time!! I am sure the girls miss both mommy and daddy. We are proud of you and all the hard work you are doing, Jody. Tiffany, proud of you for all you are doing in supporting him. Oh my!! Reading these posts are like our own story of 2 years ago. A bone marrow transplant certainly is not as painful as lungs, but the treatment before and after is! As I read this post I’m full of all the feelings I had 2 years ago. We rejoice with you and know how marvelous witnessing Jody walking and sitting up is! Sending special prayers to you Tiffany, as you are the one to see it and have to absorb it all. Jody just has to DO it….. Blessings to your whole family! Read it! 😉 Awesome!!! Glad it is going so well!!! Continued prayers as always!! You will be out of there at no time at this rate – truely AMAZING! There are not enough words to capture the awe and wonder of Jody and his new lungs!! Truly a miracle, and God has big plans for you both. Glad to see him with his ball cap back on! Take care- listen to your nurses!! And keep on blogging, Tiffany- you are blessed with inspiring words. Lots of love from all your friends at Hershey Med!! Congratulations on leaving the ICU!!! I am so happy for you and your family! God bless Dr Shah and his team. He is a wonderful healer! May your stay in Progressive Care go smoothly with very few bumps. I will be letting my church know that you finally got your gift of life. They have been praying for you since this time last year. Jody, keep up the good work. Tiff, I know your anxiety, you know my story. Your’s is already sooooooo much better. My prayers are for all of the staff at JHH caring for both of you. They do care for you too! I am so happy for you that all is going so well! You have been in my thoughts and prayers…on my way to work this week you and Jody were especially on my mind and when I arrived, I learned of Jody’s new lungs! I was shocked, then realized that God ALWAYS prompts me when He wants me to pray. I don’t know why it still surprises me! Take care of yourself, Tiffany. Jody and the girls will need you, and it’s easy to lose focus on yourself when you are so consumed with supporting your loved one. We will continue to lift you all up in prayer as we give thanks for Jody’s new lungs. I am so happy for you, Jody and your daughters! When i received my retirement book, I was so glad you included your blog address. May God continue to bless. You are such and amazing family! Congratulations! Hello my name is Candace your story about your husband is sad and inspiring to me all at the same time. I am a CF patient on the road to a lung transplant myself. So your story has pointed out the down side I still face but hopefully I will come out of it with a great outcome as well. I was at the Hershey clinic today and Patty was telling me about a man who was just transplanted and is doing great. She said you had I blog so I found it. When the time comes I too will be transplanted at Hopkins. I was happy to read your husband got to see your daughter start school. My daughter also started kindergarten this year and I was just thankful to be with her.